I love this pattern. Not surprising, considering it has over 5,000 active projects on Ravelry. I’m such a bandwagon knitter. Holy hell, this is slow going. I picked up the yarn at the Fiber Gallery in Greenwood many months ago when I saw a sign for **NEW** Malabrigo Sock Yarn!! Exciting! I saw two of my favorite colors and snatched them up. It wasn’t until I got home that I noticed the label said “lace”, not “sock”. Woops. It’s been my therapy knitting. 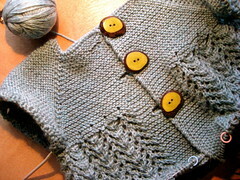 My brainrut knitting. My “I don’t want to think, I just want to knit for days” knitting. And I’m still only 25% done, tops. 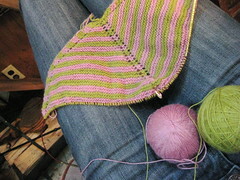 At this rate, I’ll have a lovely scarf/shawl to drape over my shoulders by the beginning of 2011. Oh lace yarn…why you gotta do me like that? I think these are seriously my only two active projects. Which I’m proud of. Of course, I do have a box of 220 coming in the mail tomorrow, courtesy of the Webs Spring sale. I couldn’t resist. I had to do it. 5 Skiens each of “mystic purple” (ooooh…), “turtle” (cute), and “straw”. To add, of course, to the three skiens each I’ve got hibernating upstairs of “pumpkin spice” and “baby rose heather”.